Measuring the flow of heat (or energy, in general) is a tricky task. Generally speaking, one has to know the temperature on both sides of a wall, window etc. The temperature difference provides a measure of the drop in temperature and, consequently, the flow of energy through the object. So in principle one has to keep an eye on both sides of the object in question. But what happens if only one side is accessible, like in a storage tank where measuring the temperature on the inner side of the vessel proves to be very difficult if not impossible? So how much energy does a hot water storage lose? Luckily, there are solutions for measuring the heat flow by using a simple gadget. With a thermal flux sensor one may easily determine how much energy goes through a wall or a window or any other object. 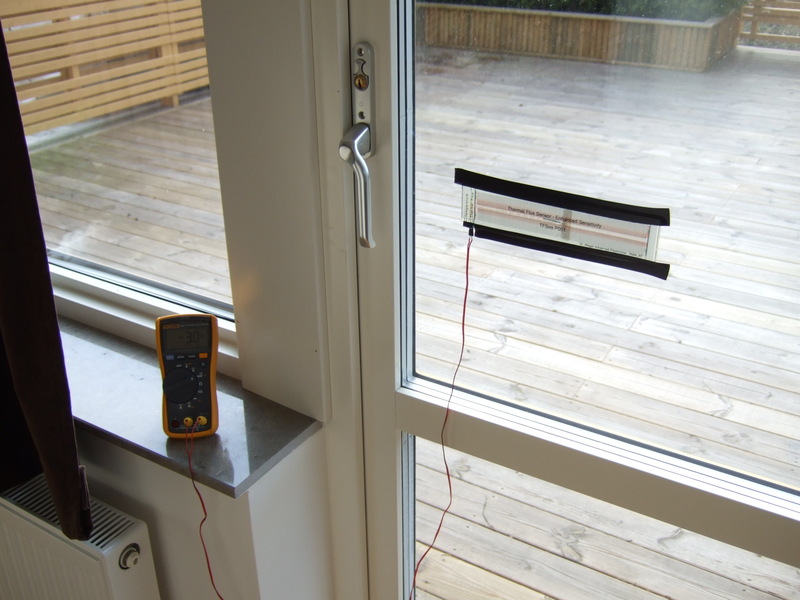 The sensor is attached to one side of the object and yields a signal which is directly proportional to the heat passing through the object and thus makes it possible to determine how much energy actually penetrates a window, wall, etc. Performing such a measurement is easy and exciting as it may reveal some unexpected features of energy leaving or entering a dwelling. We have performed a series of measurements in a house in Sweden over a couple of days and discovered some really interesting features. And yet, no sophisticated equipment was necessary. A heat flow sensor and a multimeter, that´s all it takes. The measurements took place during the last week of February 2012. Let us have a look at the results before we start discussing them in more detail (Fig. 1). Fig. 1 Measuring the heat flow through a window. The red curve shows the heat flow through a window facing a westerly direction. The outside temperature was approximately 7 °C in the morning. 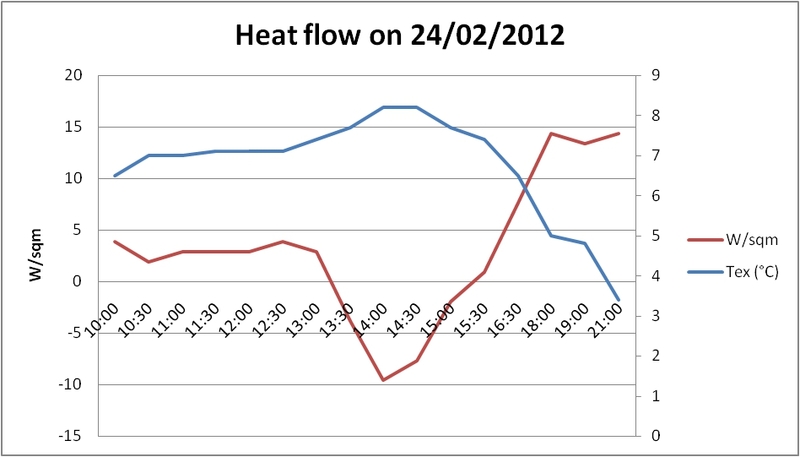 During the entire morning until 12:30 hrs the heat flow was relatively stable at about 3 W/sqm. Then shortly after 13:00 the sun slowly started finding its way through the window leading to a massive change in energy flow. In fact, we even observed an inversion of the energy flux, i.e. more energy was entering the living room than leaving it. This situation when the sun was delivering free energy through the window lasted until 15:30. Then it disappeared behind a nearby forest, and the energy flux got back to its normal behaviour which was governed by the temperature difference between the living room and the exterior. It goes without saying that during those hours of direct sun exposure the heating could effectively be switched off. During the late afternoon a significant drop in outside temperature occurred (blue curve) while simultaneously the flow of energy was rapidly increasing reaching a plateau at almost 15 W/sqm after 18:00 hrs. Since at that time it was already dark outside the heat flow was no longer overlapped by indirect solar irradiation. Now we are in a position to calculate the net heat flow during the measurement period. The heat loss was strongest in the evening when the outside temperature dropped drastically. During the early afternoon we had a net inflow of energy. The overall heat flow balance amounts to 0.063 kWh/sqm going through the window. Thus, by using relatively simple means we could perform a thermal analysis of a window. The experimental setup is shown in Fig. 2. In a recent report we analysed the savings potential of the Swedish housing sector. Sweden has committed herself to save some 12.8 Mtoe of primary energy up to 2020. Taking into account that the country used some 51.4 Mtoe in 2010, and with a consumption goal in 2020 of about 41 Mtoe, this means that savings of some 20 % within the remaining decade are at stake. One of the biggest savings potentials is supposed to be hidden in the building stock. Household energy use accounts for 23 % of the total final energy consumption in Sweden and the largest part of it is eaten up by heating purposes. In the following we look into the consumption figures for heating and warm water in Swedish households. The raw data for our investigation have been taken from Eurostat, Statistics Sweden and the Swedish Energy Agency. Fig. 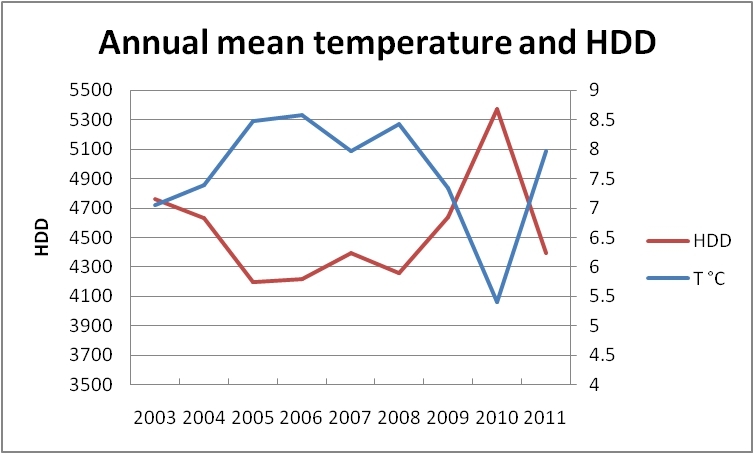 1 Average annual energy consumption for heating and warm water in Sweden. The latest construction types use significantly less energy per sqm than the older ones. This is in line with our expectations. 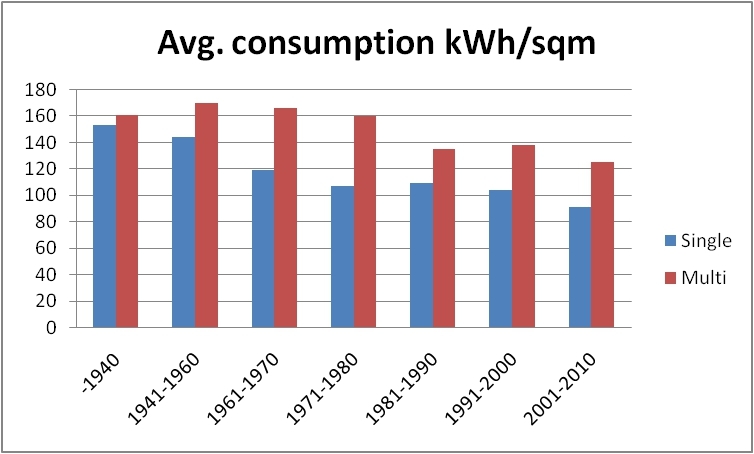 For single dwellings average consumption has dropped by some 40 % from 153 kWh/sqm to 91 kWh/sqm. For multi-dwellings the decrease was not as dramatic. Nevertheless, average consumption went down from its maximum value of 170 kWh/sqm to 125 kWh/sqm (26 %). The consumption figures per category are displayed in Fig. 2. Fig. 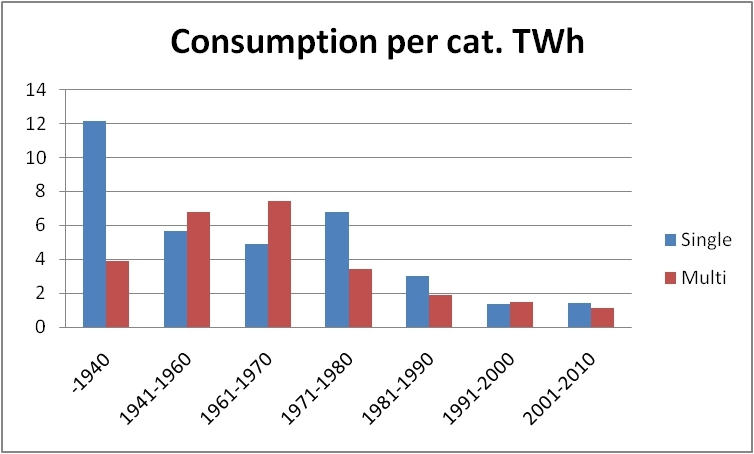 2 Energy consumption for heating and warm water by year of construction. Taking the latest construction technology as a reference, we may calculate how much energy could be saved if the entire building stock was refurbished according to that standard. The results are shown in Fig. 3. Fig. 3 Calculated savings potential by year of construction. As regards the single housing sector refurbishing the oldest part of it would account for 50 % of the total savings potential of that sector. Obviously, the younger part of the building stock would only contribute very little (2 %) to the entire potential. 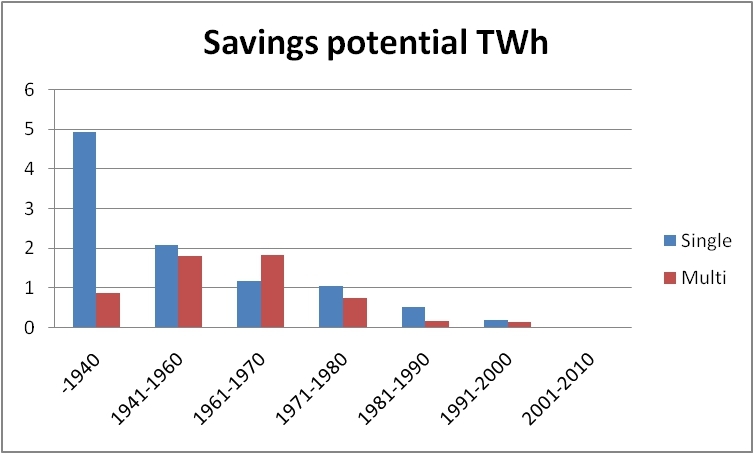 In total, we could expect to save some 9.9 TWh for single dwellings and 5.5 TWh for multi-dwellings. Thus the entire savings potential from the housing sector would amount to 15.4 TWh which corresponds to 24 % of all energy used for heating and warm water. This is an impressive number although in terms of Mtoe its equivalent is a mere 1.3 Mtoe. Thus we may conclude that renovating the Swedish housing stock would provide savings of about 10 % of the entire reduction goal set by the Swedish government (12.8 Mtoe). Having said that we have to admit that the biggest part of the task is still to be done. How Do Heating Degree Days Vary With Temperature? Once again heating degree days (HDD). In two of our previous postings we investigated the correlation between HDDs and energy consumption. The first posting aimed at highlighting the influence of the number of HDDS on gross energy consumption, while the second focused on more specific data, namely the amount of energy devoted to heating purposes. The results were not very encouraging, since no strong correlation between the two parameters could be found. In fact, we might have expected otherwise. In this posting we aim at a more fundamental approach. Is is clear from the definition of HDD that changes in temperature are reflected in the number of days where the heating needs to be switched on. This argument is straightforward on a daily basis. But does it also hold if we take monthly averages instead? Intuitively, the answer would be yes. But what we want to know is to what extent a montly average temperature may be considered a reliable measure for determining the value of HDDs. In order to find the solution to this riddle we analysed the data from Sweden during the period 2003 – 2011. The baseline heating temperature for our investigation was taken to be 20°C, but HDDs for other baseline temperatures may easily be calculated. Our analysis lead to the conclusion that there is a very strong and reliable (negative) correlation between the average outside temperature and the number of HDDs over the years. As the annual data show consistently the same pattern we are not surprised to find that the same relationship holds for the multi-annual averages taken over a 30-year period as is shown in Fi.g 1. After these enouraging findings we might wonder if we could go one step further and look at the correlation between the annual data. Thus, we take the annual average temperature and relate it to the number of HDDs per year. As the resolution gets coarser we might expect a weakening of the relationship. However, the results are once again quite stimulating since at annual level the relationship between the two sets of parameters does not seem to loosen. This is demonstrated in Fig. 2. 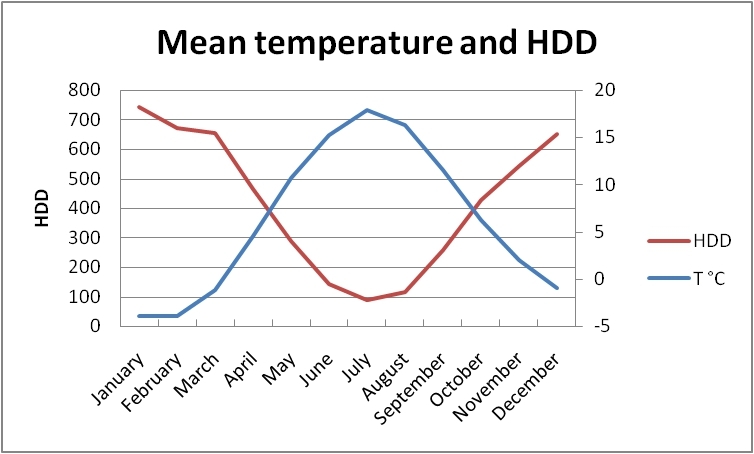 There is a nice negative correlation between the mean outside temperature and the number of HDDs, similar to the one we have seen for the monthly data. A numerical analysis of our findings leads to the conclusion that, on a monthly basis, one degree of temperature difference (T,in – T,out) in centigrade corresponds to 30.5 HDD. Thus, if the monthly average temperature drops by 1 °C the number of HDD increases by 30.5. As a consequence, the number of HDDs may be directly calculated from the mean temperatures. Needless to say, that this is in perfect agreement with our own expectations.